The Flexboard is one of the oddest products I've ever tested but potentially one of the most useful. It's a flat, one-piece, molded rubber keyboard that's impervious to water and other damaging elements. Made of polyurethane rubber rich in thermoplastic elastomer, the nonskid device is extremely flexible when laid out flat. Its keys are discrete, round, raised nubs that have a barely discernible stroke. A bump at one end, from which the cable emerges, houses the circuit board. This is no Chiclet keyboard. The Flexboard is full-sized; the distance between key centers is comparable to that of conventional keyboards. Because it is waterproof, the Flexboard works both indoors and out'use it anywhere that fluids, dust, food or other debris might get into a typical keyboard. From a sheer impenetrability standpoint, it is superior to the clear plastic sheets that fit over regular keyboards and is far less expensive than rugged keyboards built to military specifications. I sprayed my test unit thoroughly with water, dried it and used it with no problem. The Flexboard is flexible, but don't roll it up while it's still plugged into your computer. I tested the $129 office version, available from Man & Machine Inc., the U.S. distributor for KoTA GmbH of Germany. A $229 industrial version is treated to resist solvents and bleaches. Typing with the Flexboard is a curious experience. The keys, although they have no travel, are extremely sensitive. Because the keys are tough, flat rubber plateaus, it's tempting to pound on the Flexboard, but it isn't necessary. The merest touch will produce input. Lacking tactile feedback, it's easy to inadvertently repeat or mistakenly type characters'something to remember when using a Flexboard for critical data entry. I'm not a trained typist, but I am fast after a lifetime of hunt-and-peck typing. I had to watch the screen carefully to avoid typing gibberish. Also, because I was in my 20s before I ever used an electric typewriter, I still tend to pound. The Flexboard is much more effective if you barely raise your hands above its surface. A trained typist could fly through speed barriers with it. I also tried typing with wool gloves on and found that thanks to the separated keys, I could input fairly well. Another plus: On a conventional desk surface, Flexboard stays put'it won't slide around. One flaw was the space bar, which was decidedly less sensitive than the other keys. Its sensitivity seemed to vary along its length, which made typing text rather annoying because words would run together. Another quibble involved color. My test unit was somewhere between sky blue and royal blue, but the characters were gray and almost the same color intensity as the background, making them barely distinguishable in low light. The characters should be bright white. A word of warning: Don't roll up the Flexboard while it is plugged in and the computer is running. Extreme flexing, though it won't harm the keyboard, will produce a random array of rapid-fire keystrokes. Man & Machine officials said Flexboard is useful for military, industrial, messy commercial and outdoor environments as well as for classrooms. That's a fair claim. But I can see a couple of other uses. 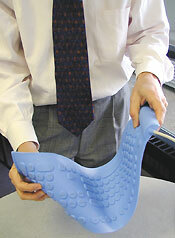 By draping a Flexboard over a curved support, you could create an instant ergonomic keyboard. The extreme key sensitivity also could translate into an enhanced computer access device for physically impaired users. You probably wouldn't want to do all your typing on a Flexboard. But for a variety of special situations, I recommend it.